1. Go to the Start Menu - Choose Control Panel or search for "Control Panel". 2. Set all items under the "Media" section to "Take no action". For XP: Go to My Computer, right click on the Bravo's Drive and select Properties. Click on the AutoPlay tab and for each content type click on the "Select an action to perform" button and choose "Take no action." 4. Double click on the AutoRun key on the right side of the screen. 5. In the dialog box that appears change the number in the Value data box to 0. 1. Click on Start - Choose Run. In the box type GPEDIT.MSC - Press Enter. This will open the Group Policy editor for Windows. 2. Click the + symbol next to Computer Configuration. 5. Right-click on the Turn off Autoplay option and select Properties. 6. Select the Enabled box and change the “Turn off Autoplay on:” option to All Drives. 7. Select Apply and then OK. Close the Group Policy editor. 1. Click the Start Icon, type in the search box that appears just above the icon. 2. In the box type GPEDIT.MSC - Click Enter. This will open the Group Policy editor for Windows. 4. Click on Windows Components. 5. Click on Autoplay Policies. 6. On the right hand side, right-click on the Turn off Autoplay option and select Properties. 7. 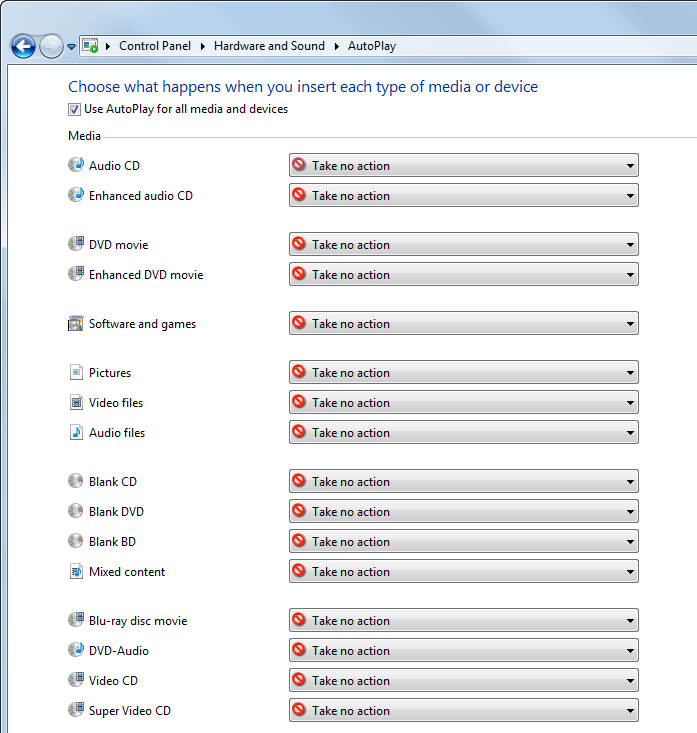 Select the Enabled box and change the “Turn off Autoplay on:” option to All Drives. 8. Select Apply and then OK. Close the Group Policy editor. Note: These changes will affect all drives connected to this computer. When a CD or DVD is inserted nothing will happen. You will need to browse to that drive and double click the drive icon for the disc to play or open.